Once you get the hang of eating allergen-free (or clean, or whole, or whatever we are calling this), you think you are in the clear. You think “I got this! I am the king of the world! I can totally eat normally again!” And then you are required to travel. In which case, you’re really in a pickle. Thank goodness for the Whole Foods in the suburb of Dayton where I am writing to you from today, and the incredibly thorough breakfast spread at the Holiday Inn Express outside Minneapolis, with which I am more familiar than I’d like to be, but you can’t always count on the availability of a wholesome, balanced meal when you’re on the road. Especially not for breakfast. 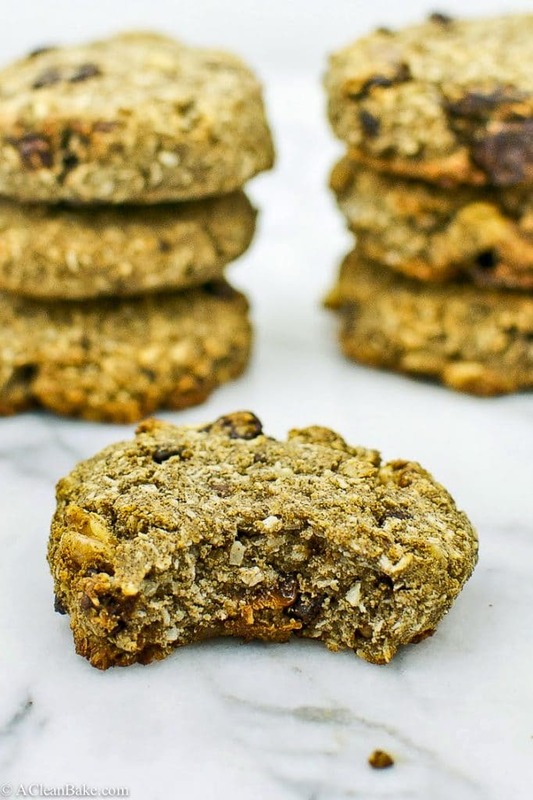 Breakfast cookies are the answer to that problem. 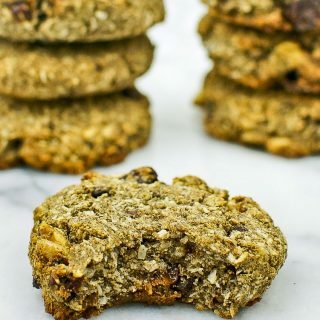 Made with buckwheat or oat flour, they take the place of hot cereal; they are nutritious and full of whole grains, healthy fats, protein, and all kinds of goodness that will keep you full and satisfied (sorry to sound like a Special K commercial but it’s true) all morning, whether you’re at your desk or at a hotel in Ohio. …or the walnuts with pecans, sunflower seeds or macadamia nuts. So, have your way with these! Gluten free and whole grain breakfast cookies made with coconut, dried cherries and cocoa nibs! Combine the wet ingredients (almond butter through vanilla) in one large bowl and the dry ingredients (buckwheat flour through baking soda) in another large bowl, and mix each vigorously. Pour the wet mixture over the dry mixture and mix until combined. Add nuts, dried fruit and cacao nibs and mix until distributed evenly throughout the batter. Portion cookies onto a prepared cookie sheet using an ice cream scoop. Press down gently with your palm to flatten each cookie slightly. Bake for 18-20 minutes or until the edges are slightly golden. Keep cookies refrigerated or frozen as much as possible. They will keep at room temperature for a couple days, but these ingredients go rancid easily, so after more than 24 hours in the warmth of your kitchen/suitcase, they may start to taste a little off. just made these easy cookies and i likey! used cashew/almond butter and banana instead of applesauce and added a bit of mini chocolate chips. they aren’t sweet, so that means i can eat at least 2 🙂 YUM! That’s great Angela! I am so glad you liked them – and totally love the additional chocolate chips. I’m glad to know those subs work! I’ll have to give it a try next time I make these!